Our events are only possible thanks to our incredible volunteers. The success of the event depends heavily on the support we receive from more than a hundred volunteers in the months leading up to the event and on event day. 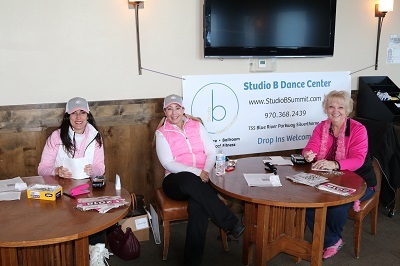 We welcome any and all fun-loving, enthusiastic, hard-working and reliable individuals who are willing to contribute to the success of Komen Colorado’s Snowshoe for the Cure. By volunteering, you help reduce event overhead expenses and ensure more funds can go where they are needed to fund breast cancer research, education, screening, and treatment. Not only will you make an impact in the fight against breast cancer, you will also walk away feeling rewarded, and meet some truly incredible people; survivors, families, and allies in the cause. How Can I Volunteer Today? 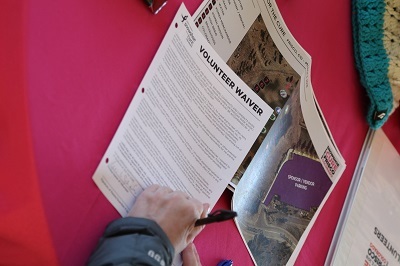 We are currently accepting volunteer applications for the 2019 Snowshoe for the Cure. Helping with pre-event planning, organization and marketing in the months leading up to Snowshoe. Setting up for the event the day before. Working with organizers and other volunteers on the day of the event, March 2, 2019, to provide the best experience to our participants. To get started, fill out the volunteer application. Already have an account on MyVolunteerPage.com? View Snowshoe volunteer opportunities and sign-up. If you are part of a group that would like to volunteer or have any questions, please email us at snowshoe@komencolorado.org.